Stream Funimation's complete library of anime shows and movies ad-free, anytime, anywhere for only $5.99 a month. Hundreds of new and classic anime with no commercial interruption. Stream anime how you want to, when you want to, and where you want to with the FunimationNow app. Get early access to Home Video dubs and new Broadcast Dubs every season. Watch English-dubbed anime as soon as two weeks after its original Japanese broadcast. The newest shows are just the beginning. Start streaming iconic anime shows and movies today! How you want to. When you want to. Where you want to. FunimationNow has free apps on mobile devices, tablets, and gaming consoles. Download the app for free on any of the devices below. Stop fighting for screen time! 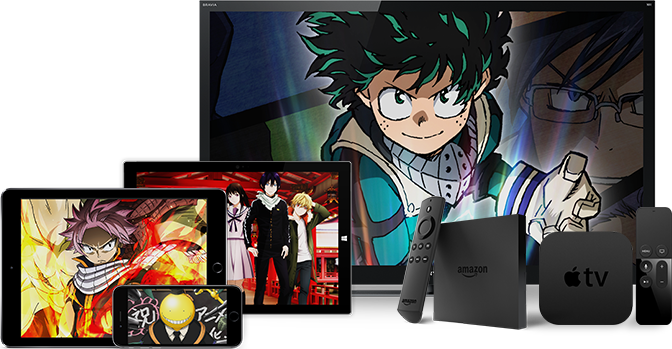 With the Family & Friends Add-On, you can stream Funimation shows and movies on up to 5 screens at a time from one account for only an extra $1.99/month. Skip the month-to-month payments and SAVE. Buy an entire year of ad-free anime for only $59.99. FunimationNow offers a completely integrated experience. It’s not only the home of the world's largest library of dubs but also a one-stop destination for streaming, shopping and sharing. *HD is subject to availability. Service available in the U.S., Canada, UK, and Ireland only. One free trial per user. © 2019 Funimation Productions, Ltd. All Rights Reserved.